TNT's second round coverage of the NBA Playoffs will continue tonight, Monday, May 8, with Game 4between the Warriors & Jazz at 9 p.m. ET. Throughout the night, Kevin Garnett will be joined in Area 21 by teammates from the World Champion 2008 Boston Celtics - Paul Pierce, Rajon Rondo, Glen "Big Baby" Davis and Kendrick Perkins. Additional Area 21 content will be available exclusively across KG Area 21 social media handles. Segments from Area 21 – with Garnett and special guests each week – will be incorporated into studio coverage on Mondays throughout the second round. 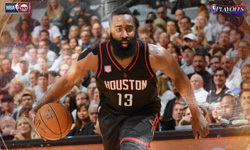 The network's coverage tomorrow, Tuesday, May 9, will feature a pivotal Game 5 matchup between MVP candidates James Harden and Kawhi Leonard when the Rockets meet the Spurs at 8 p.m. The network's live game schedule and telecast notes follow. On Wednesday, May 10, TNT will air Game 5 between the Washington Wizardsand Boston Celtics at 8 p.m. ET. If the Utah Jazz win tonight's Game 4 over the Golden State Warriors, Game 5 between Utah and Golden State will air at 10:30 p.m. on Wednesday. Following second round coverage, TNT will be the exclusive home of the 2017 Eastern Conference Finals, featuring the Cleveland Cavaliers vs. the winner of theBoston Celtics/Washington Wizards series. The Eastern Conference Finals will begin on either Monday, May 15, or Wednesday, May 17. Rockets/Spurs will be called by Kevin Harlan, analyst Reggie Miller and reporterAllie LaForce. Play-by-play announcer Ian Eagle, analyst Greg Anthony and reporter David Aldridge will be on the call of Wizards/Celtics. Brian Anderson, Kevin McHale and Lewis Johnson will provide commentary and analysis of the Warriors/Jazz series. The Sports Emmy Award-winning studio team of host Ernie Johnson, Hall of FamersCharles Barkley and Shaquille O’Neal and two-time NBA Champion Kenny Smithwill provide pregame analysis, halftime updates and extensive postgame coverage onInside the NBA presented by Kia regularly throughout the playoffs. TNT Overtime on NBA.com and in the NBA App will deliver enhanced coverage for over 30 playoff games – more than ever before – with exclusive content and analysis from TNT commentators. The unique companion experience allows fans to watch the game via four alternate camera angles, including Advanced Performance Replays sponsored by Nissan throughout the entirety of the playoffs. Additionally, live streaming coverage of all NBA on TNT playoff games is available viahttp://www.tntdrama.com/watchtnt and the Watch TNT app. Fans are able to access the games whenever and wherever they desire by logging in with the user name and password provided by their TV service provider.